I did have such a tunnel like this. Both the kids and the kitties found it quite fun! Then one day my male cat went potty in it and that was the end of all that fun!! Anyway I am sure kitty would love another one to play in. Do you have toys like this for your pet? Here is your chance to win in the Jackson Galaxy Cat Toys #Giveaway! 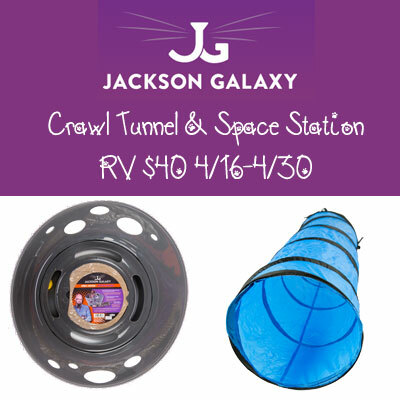 This Jackson Galaxy Cat Crawl is a fun little tunnel that allows your cat to find privacy, rest, engage in stalking behavior and more in the comfort of her own private shelter. This collapsible nylon tunnel is easy to store or transport, features metal supports for sturdiness, and promises to become a favorite hangout for your kitty. We love watching Jackson's show in my house, I've learned alot from his show! My oldest cat is 13 & she loves the little mouse toys, she still keeps my home rodent free. My kitten loves to play with anything really but he really enjoys the feathers on a string. My cats all love little sparkley puff balls. I get them at craft stores usually. Believe it or not, my cats favorite toys are ponytail holders or crunched up pieces of paper! We have a kitten and right now it doesn't have a favorite toy, it's scared of everything. Our daughter bought her a play mouse though, hoping she will love that when she gets a bit bigger. My cat's favorite toy is a flying bird on a stick thingy. Thanks for the giveaway! My cat loves playing with straws! My cat's favorite toy is a small plastic spring. He romps all over the house with that thing. My cat doesn't have any particular favorite toy. She just grabs as many as she can and strews them all over the house. One of my cats loves this little lobster toy. It's adorable watching her run around with it. My cat loves make up brushes and soda caps. my cat loves the strong she plays with. My cat's favorite toy is bottlecaps. Both of our cats love the feather on a stick toy. My cats favorite toy is a feather dangling from a stick. My sister's cat loves boxes. Favorite toy always.